It’s 14 degrees below zero F here this morning and I’m starting to miss summer. So it has come to pass that Number One Son (NOS) has completely lost his mind. Having just turned 17 he’s often getting the question “So, what do you want to do for a living?” Over the years NOS has given answers you would expect from my son, Skydiver, NAVY Seal, Drop Zone manager and airplane mechanic. His latest and so far most serious is ARMY helicopter pilot and I couldn’t be happier. I spent 12 years in ARMY aviation and know a few things and a few high ranking people that will help him get selected for flight school, weather it’s as a Warrant officer or after attending ROTC in college. One of the first things he asked me was weather having his pilots license would help him get a flight school slot. I told him that of course having a pilot’s license would help get selected and if selected would really help him in flight school. I told him that if he’s serious I’d pay for his flight training. NOS then asked me if I could teach him to fly. “No son, I don’t have my instructor’s rating.” “Well, couldn’t you get it and then teach me?” “Oh crap,” I thought, I’d never wanted to get my instructor rating and had no desire to teach flying. I got my fill of teaching by being a full time skydiving instructor and the thought of flying students trying not only to kill themselves but me as well held no appeal. But I had to admit that having my instructor rating would come in handy. My daughter “Super Girl” had a terrible time finding an flight instructor she liked, and it would be nice to be able to give my father and pilot friends their biannual flight reviews. So reluctantly I agreed to get my Instructor rating. Step one- hit the books and take two written tests, ugh. In the bad old days of the Cold War – back when everybody planned on ending the world, but (unlike today) nobody actually meant anything by it – aircraft carriers entering port at Subic Bay, the Republic of the Philippines would launch a two-ship of combat air patrol, or CAP prior to entering harbor. Through ancient custom and the international law of the sea (which are nearly the same thing), countries have the right to the sovereign control of their airspace and seas extending 12 nautical miles beyond their terrestrial limit, measured at low tide. Which could mean different things to different people. To a US aircraft carrier heading into Subic for some well-deserved liberty ashore it meant wrapping the deck nice and tidy and making herself pretty for the pier. But for them godless communists out there yonder it meant a chance to “innocently” overfly an imperialist running dog capitalist aircraft carrier what with its drawers down and napping, like – on account of the lack of air cover that was in it. Which would never do, because it was written somewhere in the bible – Old Testament, I believe – that any battle group commander who allowed his flagship to be overflown by a Tupolev that wasn’t being bird dogged by one of his own fighters would spend the eternity in hell, roasting over a slow fire with a spit up his arse. I’m nearly sure it was in the bible because for all those Cold War years they put the rest of us through hell to prevent it, but anyways. So if you couldn’t be overflown, and you couldn’t develop a plan for alert fighters because you couldn’t rely on having the sea space necessary to turn into the wind to launch ‘em, what you could do was launch a gate guard of CAP before entering territorial waters and then tank the hell out of ‘em until the ship entered the harbor. That two ship was us. Belgium has Van Damme? Big deal, we’ve got CHUCK! Merry Christmas! I’ve always been a big fan of seaplanes and flying boats. The romance of cruising around the world and being able to land on over seventy percent of what you’re flying over would have the makings for some really great adventures. I’m not the only one who thinks like this, below is a link to a story about a PBY Catalina that had been converted to a luxurious flying yacht. It starts out with great pictures from a Life magazine photo shoot of the beautifully converted plane and ends with it’s tragic end with the owner and his family in the middle east. Remember, be careful what you wish for, you just might get it. 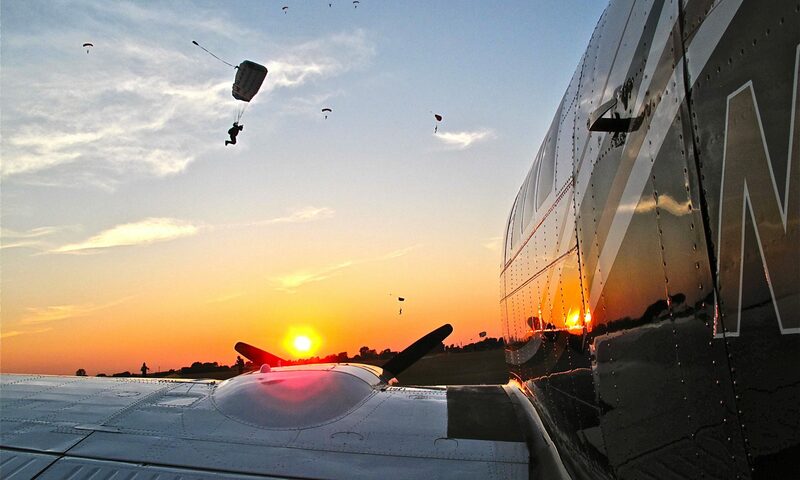 My friend Melissa’s view of the new woman’s world record for vertical skydiving formation. The Twin Otter pilots were having some fun too!